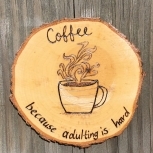 A lovely wood magnet that's a perfect addition to your fridge or any magnetic surface. 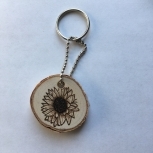 This is a great and unique gift for any bird lover. 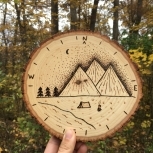 Also a great and unique Mother's Day, Wedding Gift, Birthday, or Housewarming Gift. 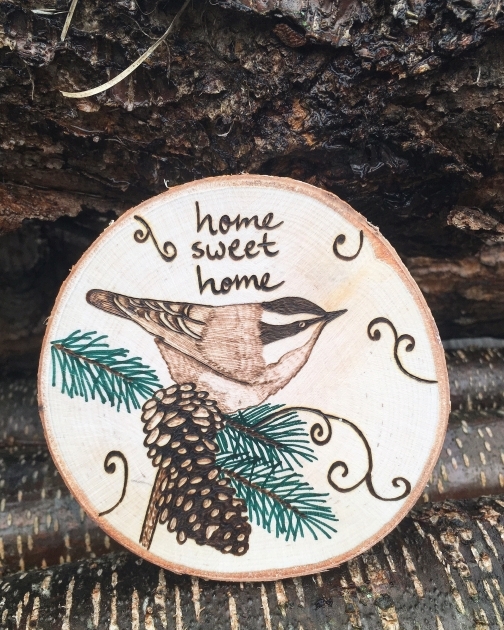 This magnet is on a large natural birch wood slice measuring approximately 3.5 inches in diameter with a hand made wood burned chickadee bird on a pine tree with green painted pine needles and wood burned pine cones with a "home sweet home" quote. 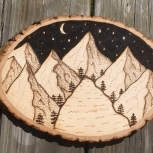 I love the green needles since they bring out a great contrast of the wood burning. 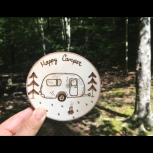 The magnet on the back is strong enough to hold a couple sheets of paper. 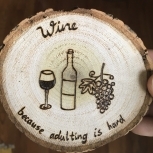 Don't want the home sweet home quote on the magnet or a different quote? Just ask me about customizations.